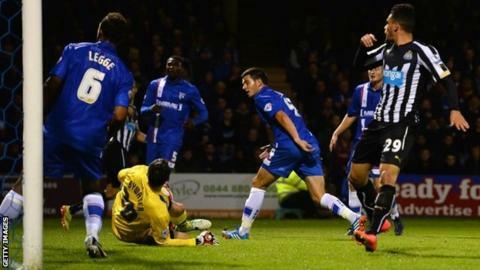 Newcastle eased into the third round of the Capital One Cup with victory over League One side Gillingham. The only goal of the contest came in the 25th minute when former Sunderland player John Egan put the ball into his own net from Gabriel Obertan's cross. The Premier League side were rarely troubled, with only Luke Norris forcing Tim Krul into making a good save. Magpies full-back Massadio Haidara hit the bar with a fierce strike before firing another effort wide. Newcastle travel to Crystal Palace in the third round. Victory was Newcastle's first of the season, having lost and drawn their first two league fixtures. Manager Alan Pardew, whose side face Crystal Palace in the Premier League on Saturday, said: "I just think we've shown real solid team performances in the three matches so far, without really getting a break in front of goal." "So many times we could have got a break tonight and we could have got a second or third goal and it didn't happen for us. "I'm hoping to get a break on Saturday, we just need one break. "It would be nice to score two or more goals on Saturday." The visitors created little in terms of goal threat, although it was more than the home side managed. The only goal came in the 25th minute when Obertan fired in a dangerous low cross that Egan turned in past keeper Stephen Bywater. Neither of Newcastle's attacking summer signings, Siem de Jong and Emmanuel Riviere, made much of an impact, although left-back Haidara did. The Frenchman was a constant threat down the wing and fired in one shot that rattled the crossbar and another that flew wide of Bywater's post. Gillingham substitute Luke Norris had his side's best chance - a rasping 20-yard drive that Dutch keeper Tim Krul tipped over. Match ends, Gillingham 0, Newcastle United 1. Second Half ends, Gillingham 0, Newcastle United 1. Kortney Hause (Gillingham) wins a free kick in the defensive half. Foul by Daryl Janmaat (Newcastle United). Delay in match Ayoze Pérez (Newcastle United) because of an injury. Substitution, Newcastle United. Yoan Gouffran replaces Emmanuel Rivière. Corner, Newcastle United. Conceded by Leon Legge. Attempt saved. Rémy Cabella (Newcastle United) right footed shot from outside the box is saved in the bottom right corner. Corner, Newcastle United. Conceded by Callum Davies. Attempt blocked. Mehdi Abeid (Newcastle United) right footed shot from outside the box is blocked. Antonio German (Gillingham) wins a free kick in the defensive half. Foul by Luke Norris (Gillingham). Attempt missed. John Egan (Gillingham) header from the right side of the six yard box is close, but misses to the right following a corner. Corner, Gillingham. Conceded by Tim Krul. Attempt saved. Luke Norris (Gillingham) left footed shot from outside the box is saved in the top left corner. Foul by Matt Fish (Gillingham). Substitution, Gillingham. Antonio German replaces Cody McDonald. Substitution, Gillingham. Luke Norris replaces Danny Kedwell. Attempt saved. Fabricio Coloccini (Newcastle United) right footed shot from outside the box is saved in the centre of the goal. Corner, Newcastle United. Conceded by Jake Hessenthaler. Substitution, Newcastle United. Rémy Cabella replaces Rolando Aarons because of an injury. Delay in match Rolando Aarons (Newcastle United) because of an injury. Massadio Haidara (Newcastle United) hits the bar with a left footed shot from outside the box. Attempt missed. Emmanuel Rivière (Newcastle United) right footed shot from the centre of the box is too high. Bradley Dack (Gillingham) wins a free kick on the right wing. Corner, Gillingham. Conceded by Steven Taylor. Second Half begins Gillingham 0, Newcastle United 1. Substitution, Gillingham. Aaron Morris replaces Josh Pritchard. First Half ends, Gillingham 0, Newcastle United 1. Danny Kedwell (Gillingham) wins a free kick in the attacking half. Attempt missed. Matt Fish (Gillingham) left footed shot from outside the box is close, but misses to the left. Attempt saved. Rolando Aarons (Newcastle United) left footed shot from the centre of the box is saved in the top centre of the goal. Corner, Newcastle United. Conceded by John Egan.